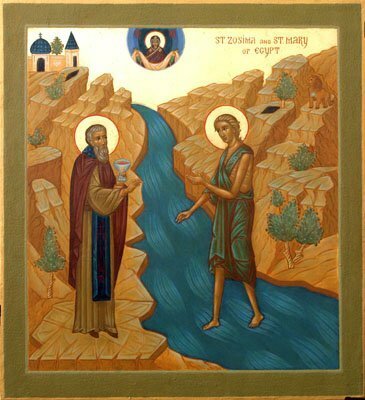 Please take some time to read the Life of St. Mary of Egypt below, and see how the love of God transforms a sinful and barren life into a pure one, and makes living water spring up in the desert, refreshing men and women of every age. “It is good to hide the secret of a king, but it is glorious to reveal and preach the works of God” (Tobit 12:7) So said the Archangel Raphael to Tobit when he performed the wonderful healing of his blindness. Actually, not to keep the secret of a king is perilous and a terrible risk, but to be silent about the works of God is a great loss for the soul. And I (says St. Saphronius), in writing the life of St. Mary of Egypt, am afraid to hide the works of God by silence. Remembering the misfortune threatened to the servant who hid his God-given talent in the earth (Mat. 25:18-25), I am bound to pass on the holy account that has reached me. And let no one think (continues St. Saphronius) that I have had the audacity to write untruth or doubt this great marvel –may I never lie about holy things! If there do happen to be people who, after reading this record, do not believe it, may the Lord have mercy on them because, reflecting on the weakness of human nature, they consider impossible these wonderful things accomplished by holy people. But now we must begin to tell this most amazing story, which has taken place in our generation. I also added a few more words calling forth general laughter. Seeing my readiness to be shameless, they readily took me aboard the boat. Those who were expected came also, and we set sail at once. And let us also give glory to God, the eternal King, that He may grant us too His mercy in the day of judgment for the sake of Jesus Christ our Lord, to Whom belongs all glory, honour, dominion and adoration with the Eternal Father and the Most Holy and Life-giving Spirit, now and always, and thought all ages. Amen. this text was taken from the Orthodox Page in Europe. No other publication data given.